Their works will join a Sir John A Macdonald sculpture, “A Canadian Conversation” by Ruth Abernethy, unveiled in June, 2016. All completed sculptures will be installed on The Prime Ministers Walk on the municipal grounds at Castle Kilbride, a National Historic Site in Waterloo Region. Two new works will be unveiled by Canada Day, 2017. A third sculpture will be installed in November, 2017. The three Prime Ministers selected for these commissions will be announced in mid-June, 2017. 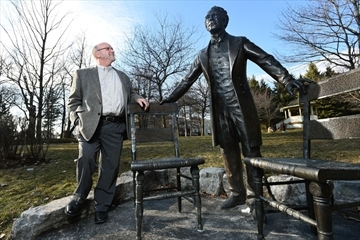 The collection of sculptures of Canada’s Prime Ministers will continue to grow as funds are available. Donations to the project can be made at www.creativeenterprise.ca.>createscape. Biographies of the participating artists are attached below. New Brunswick artist Darren Byers has been building furniture and working with wood for over twenty years. In addition, for the past twelve years, he has been sculpting and woodcarving. Darren’s sculptures are located in the United States, Canada and Europe. Fred Harrison has been a successful mural artist for twenty years, mainly painting in the London, Ontario area for private homes and businesses. His last major project was in Saskatoon, Saskatchewan, restoring the Roxy, a 1930 atmospheric theater, where he was responsible for the décor and added two small murals to the lobby area. For the past six years Fred Harrison & Darren Byers have been working together to create large scale bronze sculptures in a studio near Sussex, New Brunswick. An outstanding example of their combined talents is a bronze likeness of Canadian literary critic and theorist Northrop Frye. A version of this work has been installed in Moncton and another at Victoria College at the University of Toronto. Alan Henderson is a Canadian artist whose sculptures range from handheld pieces to large public monuments. His work focuses on the representation of a subject and the nature of representation itself.